Baffles can be installed in any ModuTank Inc. tank. Multiple baffle systems, weirs, flaps and other features can be built to suit specific needs. 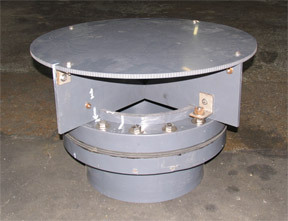 Baffles are prefabricated for easy handling and bolt-in assembly. Built in floatation logs and flexible construction allow baffles to adjust to changing fluid levels. Ballast chains or weighted pipe in sealed pockets anchor the baffle’s bottom edges. Floating cover vent assemblies provide vapor space and simple means of venting gasses that collect under the cover. Steel vent housings, available in sizes from 2” and up, are fitted with replaceable polyester filters. They are attached to liner encased support plates buoyed by floatation logs. Single or multiple vents can be attached anywhere on the cover. A typical vent prior to installation is pictured. Fabricated from aluminum or galvanized steel for long maintenance-free life, our heavy-duty OSHA compliant ladders feature slip resistant, self- cleaning steps and are available with or without platforms, extensions and safety cages. Ladders can be located anywhere around the ModuStor tank circumference. Through-the-wall standpipes are fully adjustable from vertical to horizontal positions for precise level control. Standpipes are raised or lowered by running a nut up or down a built-in threaded adjusting rod. They are available in wide range of sizes from 4″through 12″in PVC, or larger in stainless steel. Vortex eliminators can be fabricated from stainless steel or plastic to fit virtually any size inlet or outlet fitting. Units are free standing or can attach to fittings/piping without liner penetration. Sight “glasses” feature impact resistant transparent flexible tubes that can be manufactured to any required length. Flanged bulkhead fittings permit rapid installation anywhere on the sidewall of tank. Valves are provided for drainage and to facilitate tube replacement. Unit can also be used for leak detection with multiple liner system.